Bloom: Navigating Life and Style* by Estee Lalonde-Estee has long been one of my favourite YouTubers and bloggers. Her enthusiasm is just infectious and I love the aesthetic that she curates for herself, her home and in general really. I have a girl crush on Estee Lalonde, okay? Now that's out of the way, Bloom is a meticulously designed, carefully curated treasure trove of content themed around the categories of; life, people, work, beauty, fashion, home, travel and food. Bloom shines a light on Estee's story and passions. As well as being beautifully presented, it offers a very relatable insight. I found myself laughing and crying at times reading this. It's definitely one for the Estee fangirls among us but even newbies should have a peruse of this. Face by Sam and Nic Chapman-Like Estee, I have long been a fan and lover of Sam and Nic, aka Pixiwoo's work. I'm sure many of us own one, if not several of their amazing Real Techniques brushes as well. Their new book which has been a number of years in the making does not disappoint. 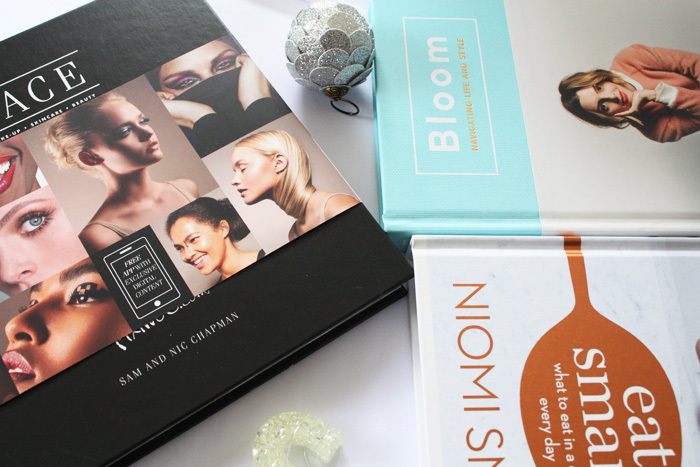 It's an absolute encyclopedia of beauty knowledge and is presented in a way that doesn't feel condescending. It's just like reading a transcript of one of Sam and Nic's many tutorials but better. There's also an app to accompany the book which gives readers the chance to watch videos and see what is being written on put into use. It's beautifully presented as you would expect and beauty-lovers alike would love this. I'm enjoying slowly making my way through it so I can savour its contents for as long as possible. Eat Smart* by Niomi Smart-As I said last month, this was perhaps a bit of an unusual book request for me and while I still haven't had time to really play around with any of the recipes yet, I have a ton bookmarked. The smoothies all sound absolutely delicious and given the number of times I frequented Boost in Melbourne, I'd love to recreate some at home. As well as recipes, Niomi also shares insight into her own lifestyle journey and what led her towards a more plant-based lifestyle. Again, it's beautifully presented and while there is the odd obscure ingredient, most of the recipes can be made with items in your pantry and seasonal fruits. I'm all for books that make the most of ingredients people actually don't have to go on a wild goose chase for. I'm really looking forward to making some of the non-alcoholic cocktails and iceblocks in the coming weeks, along with virtually 20 or so other things I have bookmarked. You Deserve A Drink by Mamrie Hart-Not pictured but equally as worth mentioning is Mamrie's book with the tagline 'boozy misadventures and tales of debauchery'. Each essay is accompanied by the recipe for an alcoholic beverage, would you expect any less from the lady whose YouTube channel is called You Deserve A Drink? It's hilarious, laugh out loud funny and brilliantly written. If you know someone who loves a good humour laden essay, this is the book for them. -What books by vloggers and bloggers do you enjoy?